Recently the number of metro payment tokens available for sale in St. Petersburg has been restricted. Residents of Putin's home town, quite sensibly, had been trying to protect themselves from further collapse of the ruble by panic buying huge numbers of these tokens. These residents know that their government is powerless to halt the fall of the ruble and resultant inflation - and by limiting sale of these tokens is merely providing tangible confirmation of this. Eventually such a seemingly trivial series of events can turn out to be a last straw that can even trigger revolution..
President Poroshenko's press service today revealed that after telephone conversations between the leaders of Ukraine, Russia, Germany and France it was agreed a meeting of the contact group on resolution of the war in eastern Ukraine will to take place in Minsk on Wednesday and Friday this week. One of the Donetsk People's Republic 'capos', Denis Pushilin stated they too were ready to attend in the the contact group format in Minsk, on December 24 and 26 December, but do not know anything further about it. "Today Ukraine are has not communicated with us and did not coordinate a date for the meeting, however, we are ready for such a dialogue on these dates," said Pushilin. In other words, so far, they have not been invited to this meeting of the 'grown-ups'. Ukraine's first president Leonid Kravchuk quite correctly maintains: "...the signatory countries of the Budapest Memorandum should gather and draw conclusions as to whether the main core of this pivotal document - ensuring the territorial integrity and sovereignty of Ukraine - has been adhered to. [Such a meeting] should take place - but it should not be ambassadors who attend but rather heads of state who signed the document. Then there will be something to talk about. Everything else is the pushing away any solution." The heat is now getting to Putin after the week the tide turned and broke his dreams..
Dognat' i peregnat' - 'to catch up and overtake' looks further away than ever..
And without Putin's life support system his ugly creations DNR and LNR will wither. Russian support for the separatists in eastern Ukraine doesn't all come directly from the Kremlin. The rebellion there may be stoked, and armed, by Vladimir Putin - but it's also become a personal cause for young Russian volunteers recruited by a variety of nationalist and far-right groups. Many say they're motivated by their Orthodox faith - and their dream to restore Novorossiya, or New Russia, the territory which encompassed eastern Ukraine under the Tsarist Empire. Passionate members of re-enactment societies, they've spent their weekends reliving Russia's historic battles. But now they're fighting - and sometimes dying - for real, in what they see as a test of their own, and Russia's, "manhood". Tim Whewell has gained rare access to the weird, shadowy world of Russia's radical nationalists. He travels with volunteers from the grand old imperial capital, St Petersburg, to the chaotic, muddy battlefields of eastern Ukraine - and reveals a movement whose leaders have become increasingly influential in Putin's Russia - but is now in danger of becoming an embarrassment to the Kremlin." My forebears used to tell me in Soviet times, even under Stalin, when citizens grumbled and complained to one another about shortages, the price of consumer goods and how terrible life had become, often someone would chip in "здесь не Америка" ...[what do you expect]...'this is not America'. Maybe this is the reason for Putin's hatred of the west...deep inside he knows "здесь не Америка"
May I commend to my right hon. Friend some advice from Karl Marx, who, as European correspondent of the New-York Tribune, observed that there were“vital interests which should render Great Britain the earnest and unyielding opponent of the Russian projects of annexation and aggrandisement.”He went on to say that in“the arrest of the Russian scheme of annexation…the interests of…Democracy and of England go hand in hand.”Does my right hon. Friend agree that for the United Kingdom, Europe, the west and indeed the whole world, one of our most important foreign policy priorities for 2015 should be to see that Russia behaves, as one would expect a member of the Security Council to behave, in the interests of international law? I very much agree with my right hon. Friend. I have not spent as much time studying Karl Marx as he has, or perhaps even as the Leader of the Opposition has—I do not know what goes on in Camden these days. In this respect, Karl Marx was right that the interests of the United Kingdom and democracy go together. We should stand up very firmly against the Russian aggression that has taken place, and we led the way in Europe in making sure that there were sanctions. What the combination of the lower oil price and the sanctions is showing is that it is not possible for Russia to be part of the international financial system but try to opt out of the rules-based international legal system. That is what is being demonstrated, and we should keep up the pressure." “The only thing Russia can do [to get out of the mess into which Putin has driven his country] is to have the sanctions ended,” which would restore some normalcy to the financial system....I don’t see any other options,” says Anders Aslund. BBC Economics Editor, Robert Peston says much the same: "Russia is massively leaking cash. And absent an entente with the West over Ukraine, which does not look imminent, it is challenging to see how the hole can be plugged." This would require giving in to the West’s demands regarding Ukraine, i.e. a spool-back to the Minsk Protocol and holding fresh elections in separatist-held territories in accordance with Ukrainian law. History shows, political leaders who wield great power seem to be embraced by an invisible impenetrable shield. But eventually, imperceptibly, inevitably, this shield self-levitates..and they then resemble vulnerable mortals...This is now happening to Putin. Bellicose bluster from Putin tomorrow [live feed 9a.m. GMT at this link] will expose his inadequacy even more.. In the weeks and months to come, according to Vitaliy Portnikov, unless Russian elites can somehow persuade Putin to 'get back to reality' and change tack soon, the degradation of the Russian economy, and the resultant break-up of the state, is inevitable. We should all be prepared for the consequences. p.s . Igor Strelkov/Girkin says almost all humanitarian aid from Russia to the separatist-held territories in Eastern Ukraine is stolen and then mainly comes to light on the market. Is anyone surprised considering the gangster thugs and crazies currently running the place? Why is Ukrainian airspace closed? "It seems, not only DNK, HRK and OZH airports are closed, but the entire eastern Ukrainian airspace too ..."
[LEvko thinks this may be serious stuff...Threat of SAM terrorist attack? Clearance of playing field before possible hostile air attack? Military build-up continues in Donbas.. In December 1994 the "Budapest Memorandum on Security Assurances" was signed by Ukraine, Russia, the United States, and the United Kingdom. "It is not a formal treaty, but rather, a diplomatic document under which signatories made promises to each other as part of the denuclearization of former Soviet republics after the dissolution of the Soviet Union. In return, Russia and the Western signatory countries essentially consecrated the sovereignty and territorial integrity of Ukraine as an independent state." The violation of Ukraine's territorial integrity this year by Russian forces and their proxies has caused the greatest crisis between Russia and the West since the fall of the Berlin wall. It has caused much disquiet in the United Kingdom too, not least because of the obligation the UK has to Ukraine with regard to undertakings given in the Budapest Memorandum. Several days ago, on December 11, a Backbench Business debate took place in the UK parliament - Ukraine and the UK's relations with Russia. The full transcript of the debate can be read here. Russia might seek to move beyond eastern Ukraine and establish the land link between eastern Ukraine and Crimea, and at the same time acquire a seaport at Mariupol. There have been suggestions that that is in the Russian mind, and there is heavy troop build-up that might support the idea, but whether it happens we must wait to see. We must make it clear, however, that were it to take place, there would be severe consequences...."
Meanwhile, "Five Ukrainian servicemen seriously wounded in fighting with pro-Russian separatists will be treated in a British hospital, British Foreign Secretary Philip Hammond announced Sunday." p.s. Please listen to this BBC 'From Our Own Correspondent' Podcast about the fantasist crazies from Russia who are now fighting in Ukraine: "for God, Tsar and Nation'. That's the motto of some of those fighting with the pro-Russia separatists..." BBC's Tim Whewell talks to them about their dreams of a new Orthodox autocratic state..."
"He who was nothing will become everything"
A Ukrainian forebear of mine who served proudly in the Red Army in WW2, after a brandy or two, would sometimes lustily sing a stirring version of "The Internationale", in Russian. to its foundations; and then we will construct our, new, world. Who was nothing will become everything. One of the leaders of the Donetsk People's Republic, DNR Alexander Khodakovskytoday admitted that a large percentage of the militant insurgents are "the marginalized" and "antisocial elements". He stated this at a meeting with students of the Donetsk Technical University. Khodakovsky also admitted that many serious road traffic accidents in the occupied territories were the result of "stupid bravado" of insurgents. In yesterday's post I mentioned that the only people who have benefited in this war in Donbas have been the "losers, lumpen proles, loafers, alcoholics and drug addicts - it's their time now"
P.s. If you have 50 minutes to spare please watch Mark Galeotti's brilliant assessment of Putin's geopolitical strategy, his strengths, and his weaknesses; and why the fate of Ukraine is so important. "From Donetsk to "DNR". The reality of an occupied city"
..a modern city has turned into a dark prison in which the hostages are hungry elderly persons, schoolchildren, students, Donetsk residents returning from forced leave who have failed to find work in other cities, or simply those who have nowhere else to go. And for those who for 20 years have not been able to find a place in the new realities of a market economy, or just the losers, lumpen proles, loafers, alcoholics and drug addicts - it's their time now. Suddenly there was a possibility of a social elevation when a parking attendant or car or mechanic could instantly gain power and glory. It is not necessary to work to buy an automobile, for example. It's enough to have a machine gun and a camouflage outfit. A mix of Somalia and the Soviet Union in one bottle? Yes, this is Donetsk [now]. We have been transported from the 21st. century into the grey, hopeless '90s. A good part of the city's commercial business rushed to close or move to other regions when the 'Anti-terrorist operation' started, and those that remain have no possibility to carry out their activities normally without re-registration with the DNR . Thus, the largest shopping and entertainment centre ,"Donetsk City" is closed and 'branded' stores are boarded up on the main shopping strips, awaiting 're-registration'. Motor vehicle showrooms are empty, looted by insurgents, some have had advertisement logos removed already. Only markets, small private businesses and local supermarket chains now operate in Donetsk. Also key fobs, lighters, fridge magnets, praising the "DNR", "New Russia" and the USSR are hot right now. Donetsk probably now resembles the Soviet Union in the last year of its existence. Armed men are seen everywhere, often drunk. Once familiar traffic jams have disappeared. Smart automobiles are a rarity on the street having been replaced by my much more modest crumpled Ladas. Many drivers, either from fear or from an excess of pride, "decorate" their cars with DNR flags, stickers and decals. Nevertheless the city remains clean and warm thanks to courageous service workers who carefully monitor utilities. There have been few power outages and damage to water supply quickly is repaired during the day. The heating season started on time this year. Night life in the city has markedly declined. Public transport runs only to 20:00 at best, and taxi services take fares only until 23:00. DNR police patrols start to catch curfew violators after 22:00, so after dark people tend to go home quickly. Some citizens do not turn on the lights in their apartments, so as not to tempt 'crazies' shooting at their windows. A major role in strengthening the power of the DNR was played by former police officers. They quickly changed their name on the buildings of the Ministry of Internal Affairs and city police department. But what can you expect from such a structure, whose only function was preying on victims of crime as well as the guilty parties? A lot of Donnetchany are dismayed how they were left at the mercy of separatists by Kyiv, who they consider could have done much more at the very start to hang on to the now-occupied territories. There is a growing feeling now that a point of no return has been reached. Initially there were not that many supporters of DNR, but thanks to the controversial policies of Kyiv and their inability to offer armed resistance, much has changed. It should be borne in mind that many Donchany joined the ranks of DNR out of of despair because they were at the end of their tether. They have come to the conclusion that authorities in Kyiv have already decided to hand over Donetsk forever. The consider the president's decision to discontinue pensions and civil servant salaries and freeze banking institutions is a de-facto recognition of DNR. It is amazing how a terrorist group of 55 people led by Girkin quietly went to war in our region and was not immediately destroyed by the secret services and the army. In which country in the world is this possible? p.s. Others have now picked up the themes I raised in my blog yesterday. Aleksey Polukhin, in a recent 'Novaya Gazeta' article, explains why "Operation Novorossia" is now terminated, and why there will be no Ukrainian banks nor the Russian ruble there. He calls the project "an economic dead end." In accordance with president Poroshenko's decree "On urgent measures to stabilise the socio-economic situation in the Donetsk and Lugansk regions," any social and economic activity in areas not under the control of Kyiv was to cease on December 1. In reality, operation and maintenance of ATM bank cards and accounts were discontinued a week earlier. Banks and post offices in the LNR and DNR are paralysed and payments of pensions and benefits were stopped much earlier by Ukraine. The economic blockade is the toughest challenge for the unrecognised republics, even surpassing the actual military threat. If Russia were to consider the Novorossiya as their own protectorate, even in the long term, it would be obliged to respond to all of this. Putin has said that Ukraine, by its actions has separated the the two regions from itself, adding that that Russia doesn't have claim to them either. Statements in the summer by Luhansk and Donetsk leaders promising entry into the ruble zone "in three or four months" have now been conveniently forgotten. This is in sharp contrast to Crimea, where branchs of the Central Bank of the Russian Federation were set up two weeks after their 'referendum', and by the summer total transition to the ruble was in place on the peninsula. In this situation, the unrecognised republics have no choice but to create their own central banks, and either enter the ruble zone without prior arrangement - or create their own currency. Other frozen conflict zones such as Abkhazia and South Ossetia can stay in the ruble zone because their independence has long been recognized by Russia. The problem for LNR and DNR is that any unrecognised republic can only exist in a symbiotic relationship with a strong independent player, but such symbiosis with Ukraine has been excluded by Poroshenko's decree. Symbiosis with Russia would be an unacceptable risk [and fiscal burden? F.N.] 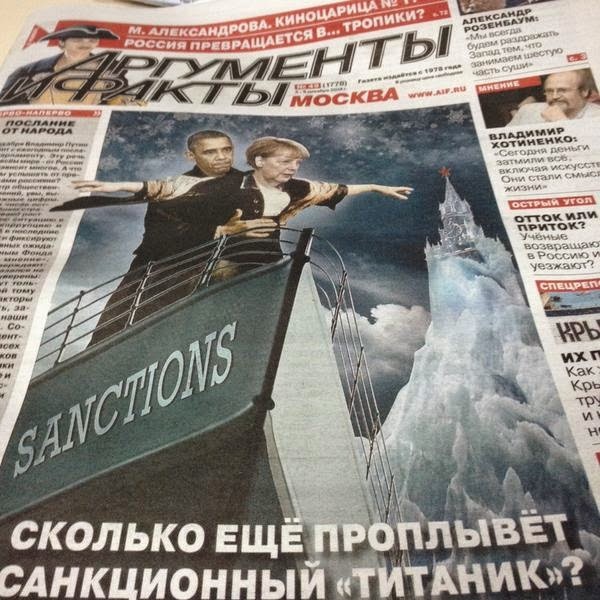 to Russia, and western sanctions against it strengthened. Russia will now be forced to accept some responsibility for the humanitarian disaster in Luhansk and Donetsk, which it seems suits the Ukrainian authorities. "Russkiy Mir" may be even more pitiless than the "Russian war." A few days ago, Prime Minister of Ukraine Yatsenyuk declared a need to resume social welfare payments in the south-east. Donbas cannot count on the ruble as currency. It's the end of the "Unification to Russia" project. In May this year DNR and LNR held a so-called 'referendum' after which they declared independence from Ukraine. On November 2 its new leaders were 'elected'. In the recent referendum on Independence for Scotland the pivotal policy question for the canny electorate was just this: What currency are we going to get? What will happen with our banks? Who will pay our pensions? Will our savings be safe? What will our relationship with the EU be? How will all of this affect our economy..our jobs...our financial security?...The failure of Scottish Nationalist parties' to answer these vital questions satisfactorily was probably the main reasons Scotland remains part of the United Kingdom today. Meanwhile, [LNR ] "is not planning in the near future to leave the Ukrainian hryvnia zone, switch to the Russian ruble or create its own currency." Watch excerpts from i.m.o. a rather uncertain, hesitant statement from Putin, in this video here. It followed a meeting with president Hollande of France a couple of days ago. Russian President Vladimir Putin and Francois Hollande discussed the need to restore economic ties between the Eastern part and the rest of the Ukraine. "Both parts of this territory need each other," he said, declaring that a significant portion of Ukrainian energy requirements are satisfied by coal mined in the Donbas. "Ultimately we need to restore economic relations, it is necessary to send in coal and get electricity back. It is necessary to establish the normal functioning of financial institutions. It can all be done and is needed as quickly as possible. According to Putin the Minsk agreement is not always being adhered to by either side. "We are for their full implementation. However, we note that neither the authorities in Kiev, and from Donetsk and Lugansk, are fulfilling either of them." "Hopefully, it will be possible for both Kyiv and Donetsk and Lugansk to emerge with mutually acceptable solutions that would satisfy all parties and, most importantly, would stop the armed conflict." The president of the Russian Federation expects that Kiev stop its blockade of the east of Ukraine. "Otherwise it is difficult to imagine the territorial integrity of Ukraine. Russia, as you know, supports the territorial integrity of Ukraine", - he said. Hollande and other western leaders will see huge disconnect here. Their security services are informing them daily of massive Russia military incursions into eastern Ukraine, but they know they have to go along with the charade to some degree for Putin to emerge from this debacle without losing too much face. Meanwhile Russian heavily armed 'volunteers' continue to flood into eastern Ukraine and pound Ukrainian forces' positions with heavy weaponry. But Putin was correct in stating that people on both sides of the front need one another to survive the winter. Coal stocks at power stations on one side of the front line [which supply electricity to customers on both sides], are critically low. Mines on the separatist side have about 2 million tons of coal stored at the pit head ready to go, but this cannot be transported because of severely damaged infrastructure and restrictions at borders. Absurdly, some coal is being imported from South Africa and beyond whilst there is plenty available a few miles down the road. These matters may be relatively simple to resolve, but even if hostilities die down for a while, what then? Administration of civic affairs, health, education etc. has been taken over by incompetent bozos - pals of the thuggish leaders of the LNR and DNR. Many experienced civic administrators have left. Millions of citizens have not received wages and salaries since the summer. Teachers and doctors are being completely messed about - and are not being consulted or paid. Some are leaving or have left...the remainder are at their wits end and may soon go on strike. The Donbas region was by no means the poorest in Ukraine, yet is now on its knees - barely able to provide basic humanitarian requirements to those not able to fend for themselves. Who is to help these people? The thugs brandishing their guns in the swanky bars and restaurants of Donetsk? In an article in Gazeta.ru your blogger picked up from Shaun Walker's twitter, the author claims the main reason for the recent resignation of several senior Russian officials responsible for the Kremlin's Novorossiya project in Eastern Ukraine was their failure to achieve greater pro-Russian sentiment there. One Russian academic reckons the LNR and DNR can now claim to exist [even thought recent elections were 'respected, but not recognised by Moscow] which in his opinion can be considered a success. But according to him, these so-called republics' future is similar to that of Transdnistria but with one important caveat. Maintenance costs will inevitably have to be borne by Russia, although the Ukrainian elites that fled to Russia should make a contribution too. "But in any case Donbas is turning into a "black hole" for the Russian economy, its politics and geopolitics. There was no strategy for Ukraine from the start. A strategic management axiom states that tactical and operational successes cannot compensate for the lack of strategy; the party that has no strategy, always loses," he said. A DNR coordinator, observing the situation on the spot agrees that there have been no long-term strategy and long-term plans, either in Moscow nor in the Donbas. "Hence all the mess" with the personnel changes. "To make far-reaching conclusions from these resignations and reassignments is mere guesswork. It makes sense only to speak only about the presence or absence of a real humanitarian or military assistance in the Donbas. It's difficult to build confidence in Russia only by providing moral protection, there has to be a physical side this - at least a full scale humanitarian mission, not to mention military aid. Meanwhile the situation for residents of Donbas is only getting worse. Hundreds of thousands of people cannot be fed and kept warm just with humanitarian convoys. The Russian Federation can provide real help by participating in the restoration of jobs and the financial sector." Many smart people will no doubt pick apart today's Putin's annual address to the Russian Federal Assembly. "After today's speech, clear Putin substituting rhetoric for ideas. But defensive note to fiery words. Is scale of Ukraine blunder dawning?" Putin declared: "Next year, we will mark the 70th anniversary of Victory in the Great Patriotic War. Our Army crushed the enemy and liberated Europe. " He conveniently forgets that in WW2 Ukrainians proportionately suffered considerably more, and contributed more in terms of lives lost, than Russians fighting in the Soviet army...Even the Soviets would not consider such an omission. The grandchildren of those Ukrainians that fought and perished defeating Hitler are now fighting just as determinedly against a Russian aggressor. Putin claimed: "No one will ever attain military superiority over Russia..."
Is this what his industrial/military complex and generals tell him? Does he ever look at the numbers? Who is he kidding? As for amnesty for funds returned from off-shore havens....I'd bet half the people in the hall listening to Putin have been scheming for weeks to dump roubles, convert them into hard currency and squirrel it away in some secret bank account abroad..Who is Putin kidding here? Crimea being as sacred to Russia as the Temple Mount is to the Jews?...well this is really something new...Kyiv maybe, but Crimea? Something sucked out of Putin's thumb? Many Russians who watched will be thinking: "Maybe the old boy is losing it. How many more years have we to put up with him?" During World War 2 one of my forebears was forcibly taken from Ukraine to Germany to work in coal mines. He would recount that in conversations with German miners during work breaks in the quieter moments underground many would confess that in their hearts they realised there could only be one outcome to the war. "There are just too many against us," they would sigh...but as loyal patriots they continued to support their "crazy herring" leader. [As Hitler was sometimes called in the Rhineland]. The scrapping of 'South Stream' by Putin a couple of days ago was a bitter pill to swallow...No self-respecting mafia capo ever, ever, makes a concession, especially a big, expensive public one like this was. Unquestionably a victory for Ukraine. A couple of days ago a so-called ceasefire was agreed between warring factions in Donbas. "The Head of the Russian representation in the south-east of Ukraine, Lieutenant-General Aleksandr Lentsov" sat alongside his Ukrainian counterpart to announce the [ceasefire} agreement".... which so far shows little sign of sticking. Today Lentsov confirmed that a ceasefire in Donbas can now be expected. Surely this is an overt admission that Russia is behind the separatists, and is trying to pull their strings. The separatists, LNR and DNR comprise a rag-bag of undisciplined war lords, that I suspect, even Putin cannot fully control. By sending Lentsov he is signalling to the separatists..I'm in charge now. It just maybe dawning on Putin: 'If you are in a hole, then at least first stop digging'. Meanwhile there are millions of citizens in terrible condition in Eastern Ukraine - who is going to look after their welfare? Who is going to help them survive the cruel winter? Who will help rebuild the destroyed infrastructure? A virtually bankrupt, embattled Ukraine? The temptation to say: "No, we are not taking it back... not in that condition," is gaining ground.